A Tweester in Super Mario Galaxy. 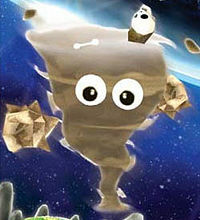 Tweesters are tornado-like enemies that appear in Super Mario Galaxy. Tweesters can be helpful at times, being used to traverse obstacles. Touching one will also cause them to spin around. If the player then spins using the Wii Remote, the Tweester will make Mario or Luigi go flying into the air and spin their arms around very quickly like a helicopter. Some Tweesters have debris traps spinning around them, which hurt Mario or Luigi if they make contact with it. They only appear in Dusty Dune Galaxy. This page was last edited on April 5, 2019, at 09:59.